There’s a lot that economists don’t agree on: monetary policy, tax policy, environmental and energy policy, and host of other complicated and obscure issues. So when you do find overwhelming agreement among expert economists on a particular subject, there’s good reason to sit up and pay attention, particularly when it contradicts what the vast majority of lay people believe. This is a lesson that Barack Obama has yet to take to heart, and we saw a glaring example of it in his State of the Union address, which was dedicated to outlining his “job creation” plan. In it, the president proposed raising the federal minimum wage from $7.25 to nine dollars per hour. If this seems like a good idea to you, you’re not alone: polls show that public consistently supports raising the minimum wage, by a lot. But you would be rather lonely if you tried to press this idea in nearly any economics department the country. In fact, 79% of all economists agree that the minimum wage increases unemployment among the young and unskilled, and there are sound theoretical and empirical reasons why. When President Obama says that by raising the minimum wage the government can, in one step, “raise the incomes of millions of working families,” he is missing the most fundamental fact about prices. A law produces not only one effect, but a series of effects. Of these effects, the first alone is immediate; it appears simultaneously with its cause; it is seen. Yet this difference is tremendous; for it almost always happens that when the immediate consequence is favorable, the later consequences are disastrous. The visible effects of an increase in the minimum wage are obvious: all else equal, some workers are paid a higher wage. But what are the invisible effects, that we would be wise to foresee? 1. Employers will use less labor. This might seem obvious to non-presidents, but when you raise the price of something, people will buy less of it. By increasing the cost of unskilled labor, employers are encouraged to invest in more capital (machines, equipment, technology) and in higher-skilled, more experienced, more productive workers. If you make labor more expensive, employers will find ways to make sure that the marginal product of that labor will be equivalent to its cost, by increasing productivity with more skilled workers or more capital equipment. 2. Unemployment among unskilled workers will rise. Workers who are making the minimum legal amount are, by definition, on the margin of employment. They tend to be disproportionately young, uneducated, inexperienced, and unskilled. If you raise the cost of employing them above what market rate for their skills are, you will price them out of the labor market. 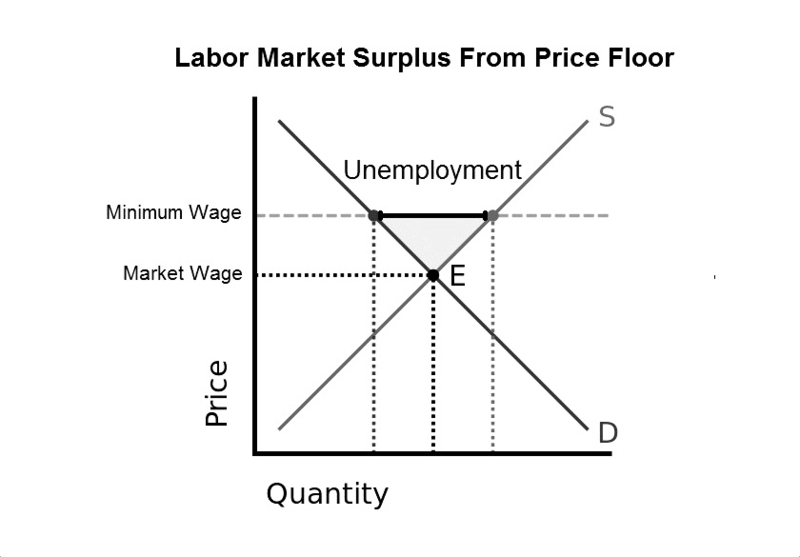 Price floors (lower limits on what people can charge for a good or service) work the same in every market: they create surpluses, reflecting the difference between the amount supplied at a given price and the amount demanded. A surplus of labor is unemployment. When the minimum wage is raised, in practice, these effects need not manifest themselves in the immediate termination of any employee making below the new minimum wage (although it may well lead to the letting go of the least productive workers). Rather, what is more likely is that it will be harder for young and unskilled people to get hired in the first place, as they compete for entry level jobs in the market. Anyone who isn’t skilled or experienced enough to produce as much in output per hour as the minimum wage requires they be paid for that work simply will not get a job. Employers will invest in more machines to raise the productivity of their employees, and hire more skilled workers. Given that low-wage positions experience a high turnover rate (McDonald’s is well over 100% annually), this means that some workers may get a few weeks or months of higher pay, only to be unable to get a job at all some time in the future, when they are back out competing in a market flooded with surplus (i.e., unemployed) workers. Their hourly wages drop to zero. What Is a “Minimum Wage” Law? For employees, minimum wage laws are rules that make it illegal for them to sell their services (generally, unskilled labor) for less than a certain amount. For employers, they are rules forbidding them from hiring workers whose output is less than the minimum wage rate–even if workers want to work and employers want to hire them. It increases the cost of labor for businesses and reduces the number of jobs available to workers. What Happens When You Raise It? or–depending on their size, profitability, and ability to adapt–they may go out of business. The minimum wage is inefficient and economically damaging, but it doesn’t hurt everyone equally. Minimum wage earners are on the margin of employment — they are the first to lose their jobs and the last to get hired if the price of labor is forced up. By pricing them out of the market, the government protects skilled workers by making their less skilled competitors unemployable. So who are these workers? Minimum wage earners are overwhelming young, female, less educated, part-time, service employees. Less than 4% of Americans over age 25 make minimum wage. Women are about 40% more likely than men to make minimum wage or less. 13% of workers without high school degrees make the minimum, compared to 5% of those with a HS degree and less than 3% of those with a college degree. 14% of part-time workers earn minimum wage vs. only 3% of full-time workers. 60% of minimum wage earners work in service industries (composing about 14% of all service workers). Data from the Department of Labor and Census Bureau shows that the disemployment effect of the minimum wage is greatest among the least educated. Because individuals with college educations earn much more money, a relatively higher minimum wage has no effect on their employment opportunities. But for workers with high school diplomas or less, the data shows a strong correlation between a larger minimum wage and higher unemployment. Those still grasping for reasons to defend the minimum wage will accuse economists of putting “theory” ahead of “people.” So let us ignore the core principles of economics and just look at what the empirical evidence shows. A wealth of literature has consistently shown that increasing the minimum wage decreases employment. The best studies continue to demonstrate a statistically significant effect for low skilled workers. A 1995 study by economists at Michigan State and the Federal Reserve showed that New Jersey’s 18.8% increase in the minimum wage lead to a 4.6% decrease in employment. Nor does the minimum wage alleviate poverty: a 1997 study found “minimum wages increase both the probability that poor families escape poverty and the probability that previously non-poor families fall into poverty. … The evidence indicates that in the wake of minimum wage increases, some families gain and others lose. On net, the various tradeoffs created by minimum wage increases more closely resemble income redistribution among low-income families than income redistribution from high- to low-income families” (emphasis added). We got a clear picture of what happens when the minimum wages jumps suddenly during the last period the minimum wage went up. In 2007, Congress passed the Fair Minimum Wage Act, which increased the rate in 3 steps. In July 2009, the final increase went into effect, raising the minimum wage from $6.55 to $7.25 an hour. In June, based on his prior research, University of California-Irvine economist David Neumark predicted that this 11% increase would destroy about 300,000 jobs for workers between ages 16 and 24. Between July and October, 330,000 teen jobs disappeared. Hardest hit were young black males, whose unemployment rate shot up from a dismal 39% in July to over 50% by September. By comparison, President Obama is asking for a 25% increase in the minimum wage. It’s not as if Congress is oblivious to the problem, either. In July of last year, the House of Representatives voted 378-11 to stop an automatic increase in the minimum wage for American Samoa. A 2011 GAO report found that the increases mandated for American Samoa in the 2007 law had led to the closing of a tuna factory, which drove the island’s unemployment rate to nearly 20% by 2010. In the final analysis, what is really being lost because of the minimum wage? Of course, there’s the lost wages unemployed teen workers won’t receive, and we shouldn’t discount this — many families need whatever supplemental income they can get, particularly when the economy is stagnant. But over the long-run, for most young workers, the main value of their first job isn’t the small income they receive but rather the development of their human capital — the skills and experience they will gain from the work itself. Those who disdain low-paying jobs as “menial” or who refuse to accept “chump change” for entry-level work are usually not thinking beyond stage one. … Young people who begin by working at McDonald’s seldom spend their careers at McDonald’s. Just in the course of one year, McDonald’s has more than a 100 percent turnover rate. What those who leave take with them is not only such basic experience as showing up for work regularly and on time, cooperating with others, and knowing how to conduct themselves in a business environment, but also a track record that enables them to move on to other and very different occupations at progressively higher levels in the years ahead. The experience and track record of from McDonald’s are likely to be more valuable in the long run than the modest paychecks they earned serving hamburgers. Put differently, whatever reduces opportunities for gainful employment for people with little or no experience has the effect of costing both them and the society far more than the lost jobs. … Reducing the number of jobs available by pricing inexperienced workers out of the market solves no problem for these workers. Exposure to minimum wages at young ages may lead to longer-run effects. … The evidence indicates that even as individuals reach their late 20’s, they work less and earn less the longer they were exposed to a higher minimum wage, especially as a teenager. The adverse longer-run effects of facing high minimum wages as a teenager are stronger for blacks. From a policy perspective, these longer-run effects of minimum wages are likely more significant than the contemporaneous effects of minimum wages on youths that are the focus of most research and policy debate (emphasis added). Given that minimum wages hurt the very people they are supposed to help, by restricting workers’ freedom, reducing their choices, and increasing unemployment, one must wonder why, despite decades of consensus among economists, politicians and pundits continue supporting these destructive regulations. They often do so because they want “send the right message” about the “kind of society” we want to live in. While this appears well-intentioned, the principle underlying such arguments is actually quite perverse: that it is better for us to feel good than to actually do good. The inverse relationship between quantity demanded and price is the core proposition in economic science, which embodies the presupposition that human choice behavior is sufficiently rational to allow predictions to be made. Just as no physicist would claim that “water runs uphill,” no self-respecting economist would claim that increases in the minimum wage increase employment. Such a claim, if seriously advanced, becomes equivalent to a denial that there is even minimal scientific content in economics, and that, in consequence, economists can do nothing but write as advocates for ideological interests. Fortunately, only a handful of economists are willing to throw over the teaching of two centuries; we have not yet become a bevy of camp-following whores. Mr. President, you are free to argue for whatever policy you think is best — but please don’t look to economists to support the idea that making labor more expensive is a “job creation” measure. We have not yet become a bevy of camp-following whores.